Discovering Sherlock Holmes was a watershed moment in my reading life, and I have remained enamored of the great detective for years. Many authors have attempted to improve upon Sir Arthur’s stories, some with success, some without. I always find myself drawn to these treatments of Holmes and Watson, even when it’s not those specific characters in play, but characters drawn in the Holmesian style. 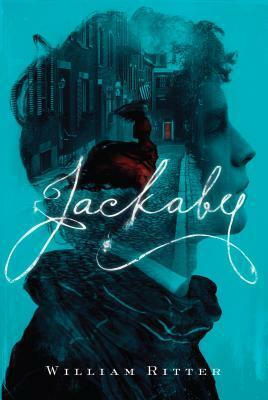 So it was with relish that I cracked Jackaby by William Ritter, which features a detective-scientist in the manner of Holmes who operates in New Fiddleham, a growing town located somewhere on the east coast of the United States (could be a young Boston, or New York). Two things interested me here: the replacement of the dour John Watson character with Miss Abigail Rook, dinosaur hunter, recently of England, and the inclusion of a supernatural element. We enter the story with Miss Rook’s arrival in New Fiddleham from a sea voyage that took her anywhere but home. We come to understand that Abigail, daughter of a famed archaeologist, had grown tired of always being left at home when her father went on digs and so took the money designated to pay her tuition at a young ladies school and scarpered off to dig for dinosaurs in Eastern Europe. When that adventure ended, she got on a boat and ended up in New Fiddleham, still looking for adventure and not a little afraid to go home. She encounters Jackaby in a tavern, where he does the typical Sherlockian assessment and recitation of where she has been, only in this version, he bases his assessment on the fairies and pixies hiding among Abigail clothes, clinging to her in passage to the new world. Abigail encounters Jackaby again when she answers an advertisement for an assistant, and finds herself among the oddities in his home, including a frog that dispenses a noxious gas out of its eyes, a neat ghost, and a duck who turns out to be a former assistant to the detective. Abigail and Jackaby are immediately plunged into a grisly murder scene in an apartment house also inhabited by a banshee. There is the usual tension and disrespect between the “amateur” detective and the “real” detective who scoffs at Jackaby’s methods (he can “feel” supernatural auras and trails left in the air when these beings pass by). Jackaby immediately discerns that an ancient evil is at work, and predicts more deaths, which, naturally occur until the evil is finally defeated. I quite liked the characters here. Abigail is a spunky, smart young woman who is not intimidated by the oftentimes overbearing Jackaby. The great man himself is somewhat endearing and very entertaining. The supporting characters, especially the young policeman Charlie Cain and Jackaby’s live-in ghost Jenny, are interesting and deserve more attention in any future entries in this series. The supernatural elements were not the usual withes, vampires, or werewolves, but unusual creatures drawn from British and world folklore. The identity and origin of the “ancient evil” is a clever and unusual bit of British/Scottish lore that I cannot recall being used anywhere else. The writing is crisp, and the plot moves along very nicely. I sincerely hope we will see more of Jackaby and Abigail Rook in the future. Highly recommended.